This vast palace complex, the first monumental early Baroque secular building in Prague, was built between 1624 and 1630 on the site of 26 houses, 6 gardens, 2 brickworks and one plot of land for one of the most powerful and wealthiest Czech noblemen of the post-White Mountain period, Albrecht von Wallenstein (1583 – 1634). Today it is the seat of the Czech Senate. The adjacent Wallenstein Gardens are open to the public during the summer. 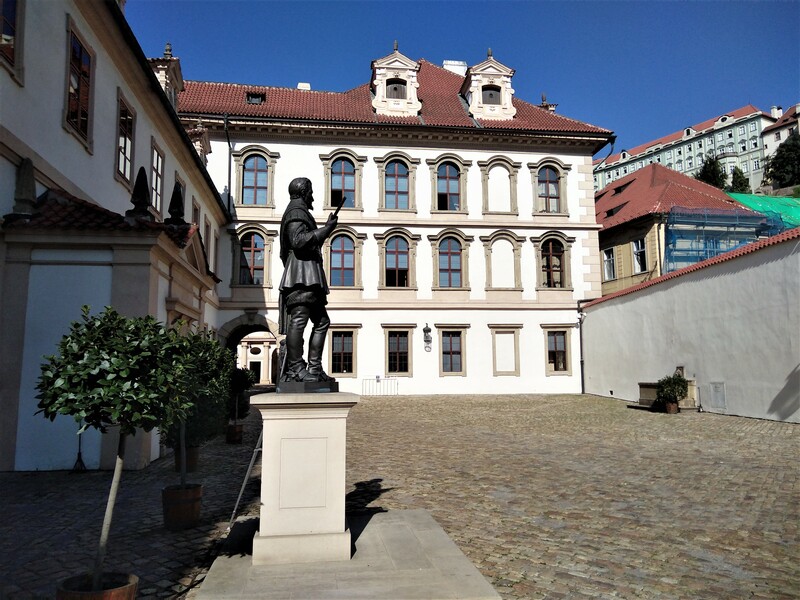 From November to March the Wallenstein Palace is open on first weekend in month from 10.00 to 16.00 only. Texts in Czech and English available in all rooms. Free admission, no guided tours. Organised groups of more than 10 people (except for travel agencies) may take part in guided tours offered by the Senate every Monday and Friday. Those guided tours begin at the top of the hour from 9 to 15. It is necessary to book a tour at least 2 weeks in advance. You may do it by calling +420 257 075 707 or personally in the Information Centre of the Senate that is open for the public every working day from 9 to 16. The tours are free of charge and last about 40 minutes. The groups are obliged to provide a list of participants (pdf or doc format) with their names and ID numbers (for those older than 15), groups of students even the address of their school. 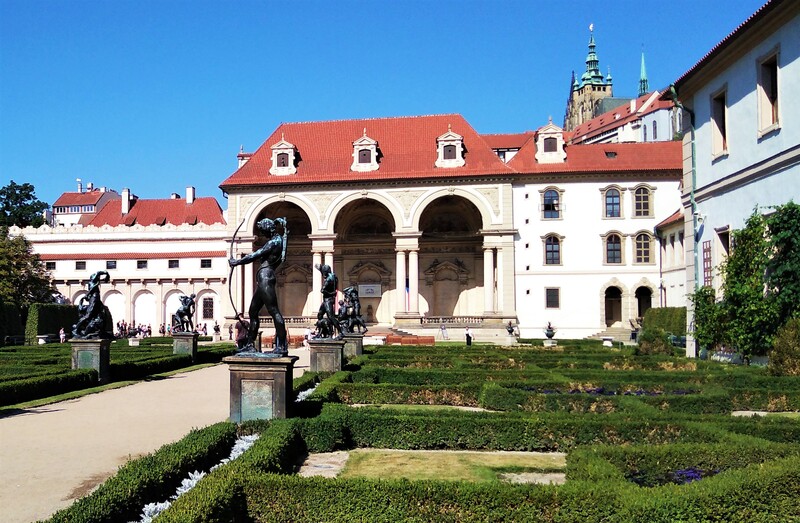 This palace is the first monumental building in style of the early Baroque in Prague. It was built between the years 1624 and 1630 at the site of 26 houses, 6 gardens, 2 brickyards and 1 building plot for one of the most powerful and wealthiest Czech noblemen of the post-White Mountain period Albrecht Václav Eusebius of Wallenstein (1583 - 1634), since 1625 a general who as an imperial generalissimo was successful in battles. He was unusually ambitious, unscrupulous and irascible, so he could serve as an example of pathological careerism. In accordance with his horoscope he ended badly: in 1634 he was murdered as a traitor in a town of Cheb on the Emperor's command for leading secret negotiations with the Emperor’s enemies. 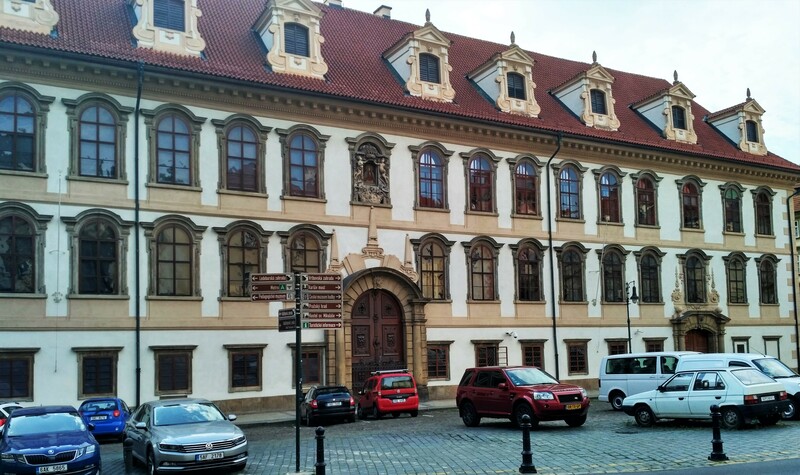 By building an extensive residence Wallenstein aimed to compete even with the Prague Castle itself. He acquired enormous property by purchasing the confiscated property of the rebel Czech Estates and he strengthened his position by his second marriage to Isabella Katharina, daughter of a high-ranking Count of Harrach. Almost everything was razed for the construction of the palace except an imposing palace of Jan Rudolf Trčka of Lípa that Wallenstein finally obtained, as well. The remnants of this Renaissance Trčka’s house, one of the most pretentious buildings in Prague of the 16th and 17th centuries, i.e. vaults, remains of plaster, brickworks and other fragments, were found and preserved after uncovering floors in the Knights’ Hall during the last renovation. Despite the resistance of the Lesser Town settlers, even the Písecká gate, which had stood there since 1257 at the present-day Pálffy Palace (Pálffyovský palác), was then demolished due to the construction. Not even the Augustinians of St. Thomas managed to resist, to whose successors the Wallenstein descendants ceded a part of the garden for their famous brewery after more than 100 years. Two-storey palace buildings and one-storey administrative and farm buildings are situated around five courtyards that are surrounded by a palace garden to the south and a riding hall to the east. Any plans or records with a name of a designer have not come down. However, the greatest work is ascribed to the Italian builder Andrea Spezzo (until his death in 1628), whose successor was Niccolo Sebregondi who finished the construction. Giovanni Pieroni carried out the construction supervision. The main palace wing with a 60-meter long frontage to the Wallenstein Square (Valdštejnské náměstí) emerged with the reconstruction of the Trčkovský House. 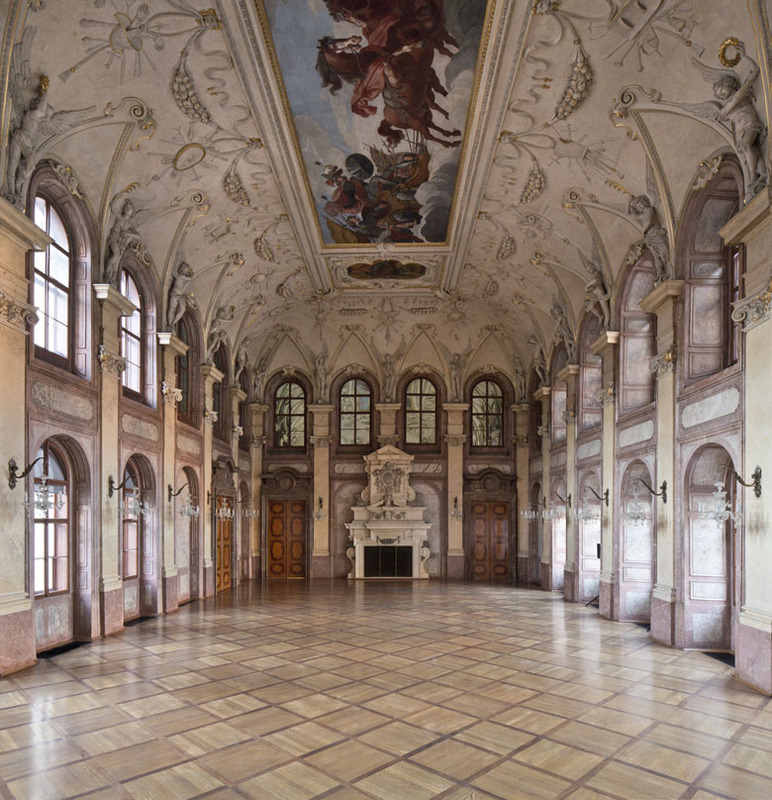 There is a ceremonial Knights’ Hall (originally called Great or Ceremonial) with two window rows above each other and with marble cased portals that were brought here from the Černínský Palace in the middle of the 19th century. The vault in the hall is adorned with stuccoes depicting geniuses and military emblems. In the middle there is a fresco by Baccio Bianco representing Wallenstein as the god Mars on a war chariot. Based on Wallenstein’s arrogance there is a gross violation of the classical mythology rules: The god Mars always rides a unicorn, while Wallenstein enforced a four-in-hand, in mythology reserved only for Helios, the god of Sun. The Leather Hall (originally called the Knights’) had walls covered with wallpapers of calf leather decorated with gold (the present-day facing is a replica from the middle of the 19th century). The stucco decorations are likewise from the 19th century. On the ceiling there is a fresco of Pallas Athena leading wars fairly by Petr Maitzner who probably painted over an original painting by Bianco. Above the fireplace there is a painting The Battle at Lützen with Albrecht of Wallenstein sitting on a horse. In this battle near Leipzig his favourite horse was killed, so he had him stuffed and exhibited in the palace. Later it was relocated to the museum in a town of Cheb. The Antechamber is a room adjoining the Wallenstein’s Audience Chamber where its personal ward used to stand and let the guests in. Anyone who requested an audience had to go through. The Audience Chamber is a circular room with a dome ceiling and it is again adorned with frescoes by Baccio Bianco, illustrating the Vulcan’s workshop where Hephaestus hosts Venus and also the allegory of Four Seasons and Four Periods of the Day. A private staircase leads from the Audience Chamber to the Astrological corridor on the second floor. There is also the Jason’s lounge adjoining a sala terrena. The Mythological corridor (also called Baroque) with 16 medallions of mythological scenes from Ovid’s Metamorphoses leads to the former Audience Hall where on the main fresco there is Helios, the god of Sun. 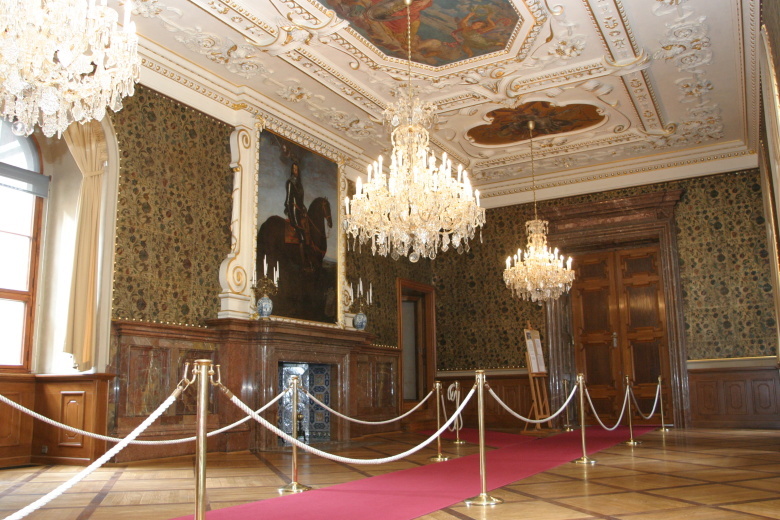 A unique chandelier in this hall comes from the Wallenstein times and it is the only one not equipped with a lighting source. The palace chapel of St. Wenceslaus, rising up through both floors of the building, is decorated with scenes from the legend of St. Wenceslaus and the oratory is adorned with the Marian lunettes. The chapel altar, the work of a cabinet-maker and woodcarver Arnošt Jan Heidelberger, is the oldest Baroque monument of its kind in Prague. The altar painting of the Assassination of St. Wenceslaus is created by Jan Schlemüller. Above the Mythological corridor there is the most remarkable space of the compound – the Astrological corridor, richly adorned with astronomical and astrological motifs mainly by Giovanni Pieroni, a renowned mathematician and astrologer, a pupil of Galileo Galilei. The Astrological corridor is a rarity where there were first published and artistically adapted new discoveries of Galileo Galilei: Jupiter’s four moons and Saturn’s two erroneous moons that in fact are its ring. Wallenstein was a passionate supporter of astrology; he always followed the astrologers’ predictions. Even Johannes Kepler himself worked out two horoscopes for him. On the ceiling of the Astrological corridor there are planets and the Zodiac - Saturn, Jupiter, Mars, the Sun, Venus, Mercury and the Luna pass there. On the side walls there is a symbolism of the four then known continents of Asia, Africa, Europe and America. A part of the complex was a pretentious and splendid stable for 37 horses, with a length of 60 m and a width of 8.6 m., with a barrel vault containing deep lunettes and rich geometrical pattern, with medallions and rich stucco ceiling. In its interior there used to stand a stone fountain with a lion's head, while gutters, columns and mussels were from brown marble and each horse box had a richly wrought grille. In addition, above each box there was a painting of a horse. These details are known thanks to the description of two English travellers who were fascinated by the splendour of the Wallenstein’s residence while visiting it. However, in the 18th century the stables were rebuilt into several smaller spaces and in the 50s of the 20th century the Komenský Museum was housed there. After its relocation in the nearby building, a stable was restored into a modern conference hall of the Senate in the years between 1996 and 1998. A bronze bust of Tomáš Garrigue Masaryk by Josef Mařatka is situated at the entrance. A part of the complex is also the Wallenstein Garden (Valdštejnská zahrada) in Italian style with a sala terrena (a garden pavilion), a grotto, an aviary and an artificial lake with an island. In the years 1625 and 1626, a collection of bronze statues and sculptural groups by significant Dutch sculptor Adriaen de Vries, depicting antique gods and horses, one of the highlights of Mannerist sculpture was placed there. The palace was looted and robbed twice: at the end of the Thirty Years' War in 1648 by mercenaries of the Swedish general Königsmark and during the War of the Austrian Succession in 1742 when the French established a depot there. It was the Swedes who took all Vries’ sculptures to Sweden in 1648 where they are located at Drootningholm Palace now. They also took a statue of Venus by Benedikt Wurzelbauer, which together with its statue of Amor and dolphin adorned a bronze fountain that Wallenstein acquired from the garden of the Lobkowicz Palace (Lobkovický palác) at Hradčany. The Venus was the only one to be returned to Prague in 1890. Its copy (the original is located in the National Gallery) has been fitted on the bronze fountain in front of the sala terrena since 1938. Along the main path and on the marble fountain in the middle of the island there are copies of Vries’ sculptures taken by the Swedish army. Arnošt František of Wallenstein had them created in the 19th century and they are still there. The Czech inventor Josef Božek demonstrated a successful test of a steamship on the pond in the garden. The sala terrena, a monumental 30-metre long loggia with three arcades and a high arch of vault at the end of the garden was built by Andrea Spezza in 1627. It is the first of its kind in the Czech lands and it ranks among his most important works of art. The Renaissance tradition has been already left here and the enchantment by Baroque style prevails. The painting decorations of the sala terrena is again the work of Baccio Bianco who chose a theme of Greek Olympus for both the wall and ceiling frescoes: in the middle there is Zeus with Hera and Venus, Neptune is on the southern side and Mars on the northern one. On the vault there are medallions of the Trojan War heroes and in an adjacent lounge there are frescoes featuring a myth about the Argonauts and the Golden Fleece. The stucco decorations were created by Domenico Canevale and Santino Galli. While decorating the stuccoes in the Wallenstein complex, the principle of horror vacui (a fear of white places) was strictly respected: the entire space had to be filled with fine art. The loggia of the sala terrena continues in caves and by the garden wall there is a perfectly evoked artificial cave (a grotto) represented by stalactites. The imitation of cave forms, which most closely resembles the Postojenské caves, does not occur in such accuracy in any similar buildings. However, nothing is known about its authors. The furnishings of the palace were magnificent: the most expensive and the first-rate carpets, furniture, tapestries and curtains were ordered from Italy and Netherlands. After the Wallenstein’s death the inventory showed 185 big Brussels tapestries, 62 oriental carpets, 534 leather Venetian tapestries and 48 pendant paintings. The total value of the furnishings was estimated at 70,000 florins; the value of jewellery and tableware at 134,000 florins. From all of this, only several paintings and a few Wallenstein’s personal items have survived, such as winkle pickers, a sword, the already mentioned stuffed horse and a European rarity - remarkable boots made from a single piece of leather. In 1765 the adjacent Augustinian monastery bought a part of the garden with a large grotto in order to extend its brewery. At the end of the 19th century the Wallenstein made the palace garden accessible to the public twice a week, on Thursdays and Sundays. In 1938 a big exhibition of the Prague Baroque was held there. On this occasion a theatre with a stage and a stepped auditorium with a presidential loge were established on the southern side of the sala terrena. In 1859 it held a gala performance of Schiller’s play Wallenstein. In spite of being later shut down, the theatre gave foundation for the tradition of theatrical performances in the garden. During the First Czechoslovak Republic the Ministry of Information and Education was housed there. In 1930 Karel Albrecht, who died in 1985 in Germany, took possession of inheritance. But after the Munich Agreement he received the Reich citizenship and became a member of the NSDAP, and thus on the basis of the Beneš decrees the state administration was imposed on the Wallenstein Palace (Valdštejnský palác) and it became the seat of various governmental institutions. In the years between 1952 and 1954 the Wallenstein Riding Hall (Valdštejnská jízdárna) was remodelled according to designs by Miloš Vincík and Julie Pecánková for the needs of the National Gallery. Countess Wallenstein with her chambermaid spent a rest of her life here when she died at the age of 104 in 1955. After more than five years of work, an extensive and expensive renovation of the palace as the seat of the Senate was completed at the beginning of 2001. 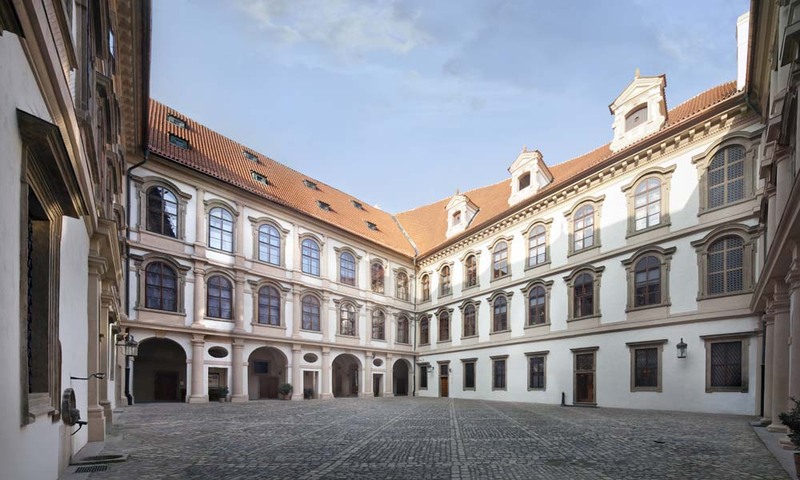 The space of the Wallenstein Palace also serves the public, for which these sightseeing tours are available: the Courtyard, the Main (Knights’) Hall, the Leather Lounge, the Hall of Mirrors, the Audience Hall, the Wallenstein’s study and the Mythological corridor. The Wallenstein Palace is a national cultural monument from the year 1995.